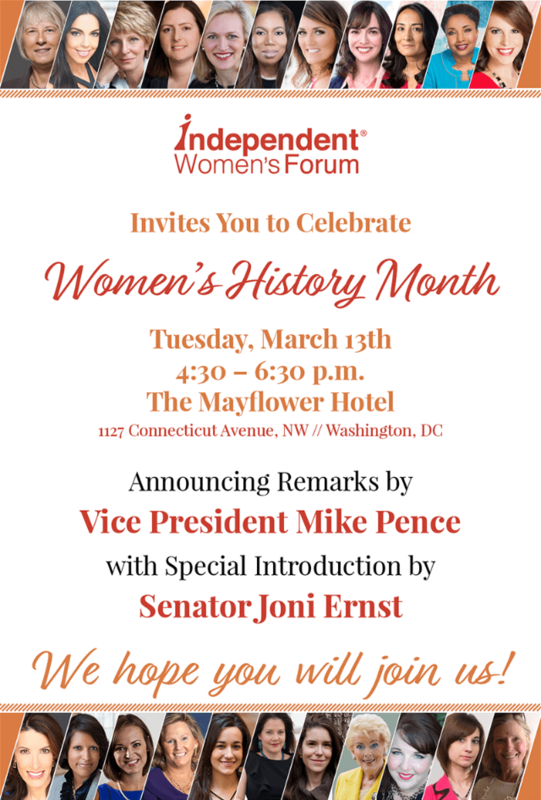 (WASHINGTON, DC) – Independent Women's Forum (IWF) hosted a Women’s History Month celebration on Tuesday, March 13th, at The Mayflower Hotel in Washington, DC, with special guests Vice President Mike Pence and Senator Joni Ernst, to honor the profound contributions of women - past and present - who have stood for liberty and sacrificed to clear a better path for others along the way. IWF President, Carrie Lukas, said: “IWF is always focused on the future, particularly on advancing policy reforms that will increase economic opportunities and create a better, freer country. But it’s important to also take a step back and celebrate all the progress our country has made and the achievements of so many women who are helping shape our world today." IWF has a long record and popular feature of celebrating outstanding women across the country whose achievements and ideas inspire and inform other women. The stories of these high-achieving women remind us that the sky's the limit for American women today.